I got hopelessly behind during Advent, and I thought I might catch up after Christmas, but alas, Bill got me a Kindle Fire along with Amazon Prime and I spent two weeks glued to Downton Abbey. I may have traveled from room to room (including the bathroom) with my Fire watching to see what was going to happen to my beloved characters. I am, in a word, obsessed. I even found a website that has the entire 3rd season posted, but I am refraining from watching it. Instead, I am watching it week by week now on PBS, for fear that I will have nothing to look forward to once it's over. I am not being at all dramatic. Anyway, I need to post what we did for the last 8 days of Advent so that next year, when I am planning what to do, I can go back and check. I had read some ideas about having your kids go shopping with grandma and grandpa for presents for mom and dad, and had initially thought that would be a great idea. Bill and I would get a date night, and the kids would enjoy picking stuff out. But then I thought, really, Bill and I don't need more stuff. And we didn't really have time to plan a date night. So...we decided to take the money we were going to give them to buy us stuff, and have them use it to pick out some things from the World Vision catalog. They each had $10 and could combine it or each pick something out. They looked through everything and agreed to get bunnies which apparently are great because they reproduce so quickly and can be used for food or sold in market. They also picked soccer balls because they wanted the kids to have something fun to play with. We did this last year as well. We took them to Baskin Robbins for ice cream before dinner. Somehow it was slightly less magical. I think it was really cold, the kids and I were all exhausted and kind of crabby and my camera battery wasn't charged. Here's the short version of what happened. They all got vanilla, Brendan and Liam were done in about 5 minutes. (they didn't finish) Rori savored her two scoops while the boys whined they wanted to go home. Rori ate hers, then wanted to finish Brendan's. We let her have a bit more until we couldn't take the whining any more and then went home. My mom had found a website that had golden tickets for a homemade Polar Express. I personally hate that movie, it's kind of creepy and long. But I loved the idea. Bill was our conductor. They had to get in their pajamas and were given a golden ticket (Grandma Hoo Hoo printed them for us, so they thought they were real). We picked them up milkshakes and drove around to look at Christmas lights. My friend Leslie had told me about this awesome house that had amazing lights set to music. It was in a gated community and they told you what station to tune your radio to. It was seriously amazing! I think they only do it every other year, so I think we have a plan for 2014! 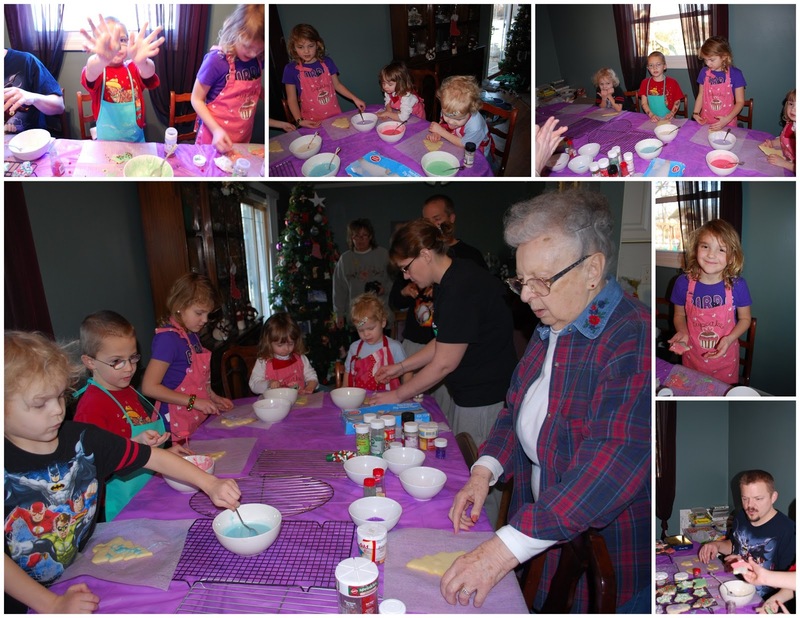 Christmas cookie day! 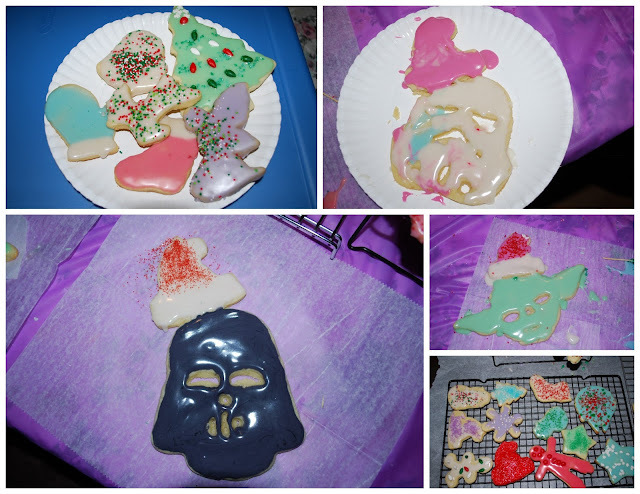 This day was our annual cookie decorating with the family. Between my mom and I, we cut out 175 or so, give or take a few, cookies to be frosted. The kids love decorating the cookies, however, I think we may have made a few too many, as they started dropping like flies when there were about 25 left. Only Rori made it to the finish. AHHHHHHH!!!! I don't remember. Let's say we watched a Christmas movie and ate pizza. Note to self, next year, don't wait a month after Christmas to remember what you did. I'm impressed you can remember all those details a month later. I have forgotten all our advent activities (at least the bad parts). Also, I didn't know that house only does their light display every other year. Also, I meant to say Downton, not Downtown. typo! BTW: Welcome back and kudos on the great memory you have!